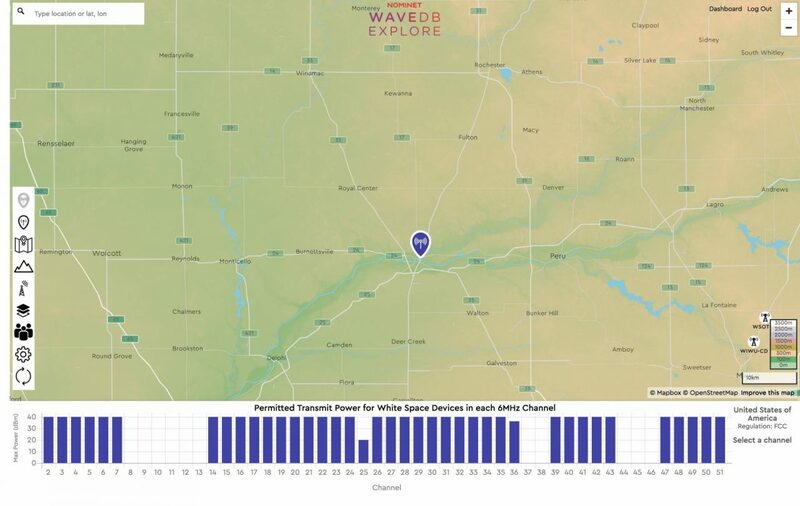 WaveDB Explore offers WISPs an easy and cost-effective way to assess the feasibility of wireless broadband roll-outs, currently in the TV White Space bands. This allows you to scope deployments, analyse channel availability in target areas and perform feasibility tests. Quickly discover how TVWS can provide fast broadband to currently underserved areas, before investing in field trials and studies. …. all from your web browser. Subscribe now for $1499 per annum. What does WaveDB Explore offer? In the following example we take a look at the area around Chicago, USA. Pinpoint the area you’re looking to connect and quickly see the number of channels available. The blue bars indicate the maximum power a TVWS radio can transmit in each 6 MHz channel. As we can see, we have good availability in channels 20 to 25 and 39 to 42. Build out your network with virtual CPEs to understand the range of your expected deployment. In the graph, you will see the channel power limits for each radio so that you can easily find the best channels to use. Adding the social demographic data layer helps you assess the economic viability of covering a specific region. WaveDB is a cloud platform developed by Nominet for spectrum management. WaveDB is the engine of WaveDB Explore and other spectrum-related services we provide. It currently supports regulatory frameworks for TVWS in several countries but can support other bands that become available for internet (e.g. CBRS in the USA). 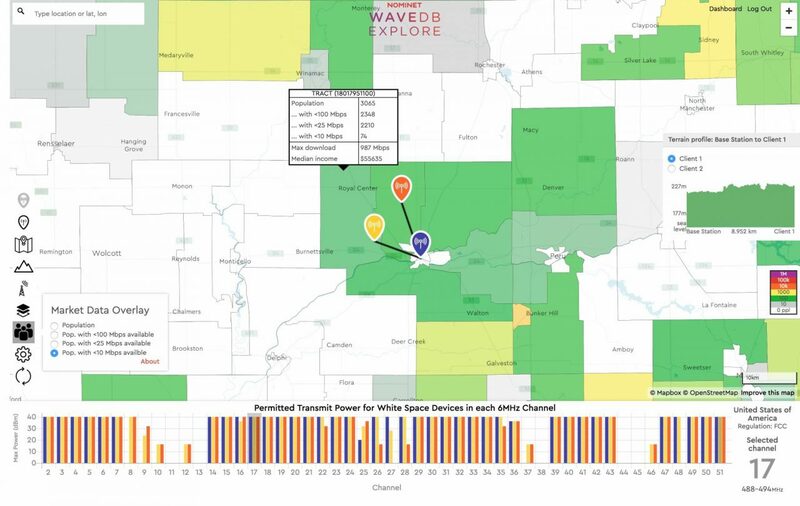 WaveDB Explore is an easy-access online tool to model TVWS coverage in areas you’re interested in. Experts and first-time users can assess TVWS feasibility. Who is WaveDB Explore for? WaveDB Explore is for network operators, ISPs and WISPs wanting to make best use of TVWS. TVWS radio vendors also use it to learn about TVWS regulations around the world to optimise products for each country. What is the scope of WaveDB Explore? While providing features that can be found in RF planning tools, WaveDB Explore does not compete with them. Those tools can complement the information that WaveDB Explore provides. I have an account for WaveDB Explore. Can I share my account with others? Although a WaveDB Explore licence can be used by all users of the same company/organisation, each user should have their own username and password. Please contact [email protected] to add multiple users to your WaveDB Explore account. How do I save my TVWS investigations? It’s as simple as copying the URL and pasting it somewhere for safe-keeping. Subsequently, after logging in to WaveDB Explore, you can paste the URL into a new browser tab. You can also share that URL with someone else with a WaveDB Explore account. They will then see exactly what you see, making collaboration simple. TV white space (TVWS) refers to channels previously used for TV broadcasting that are now available for fast wireless internet services in countries (such as USA and the UK) where a regulatory framework is in place. I have feedback, suggestions or feature requests. How can I get in contact? 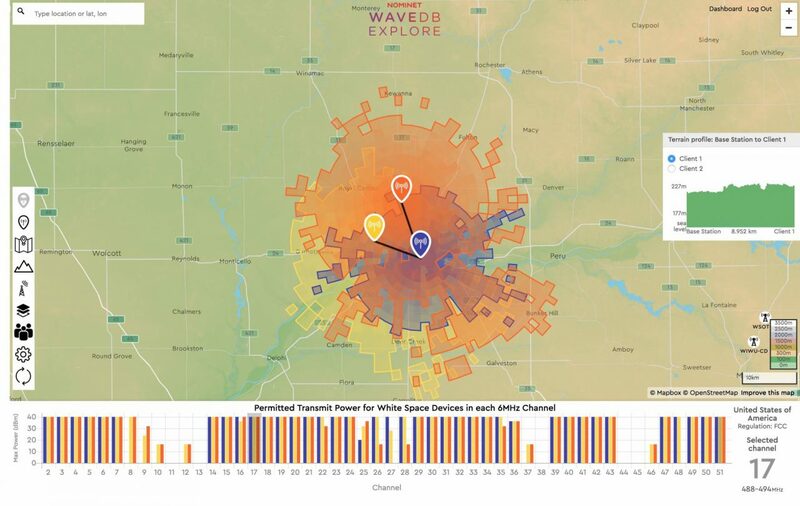 Subscribe to WaveDB Explore now for $1499 per annum to assess the feasibility of wireless broadband roll-outs in your area.